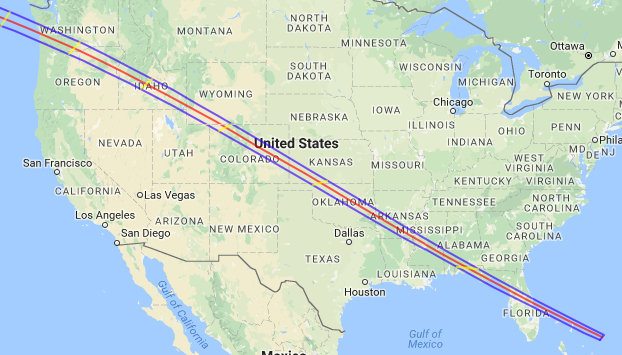 If we look at past total solar eclipses whose paths have touched the US we can see they tend to correlate with major national events that occur during the same year. 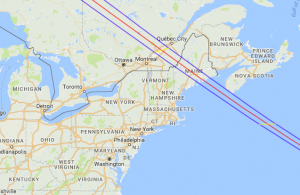 Moreover, the path of the eclipse often touches an area directly related to the event in question. 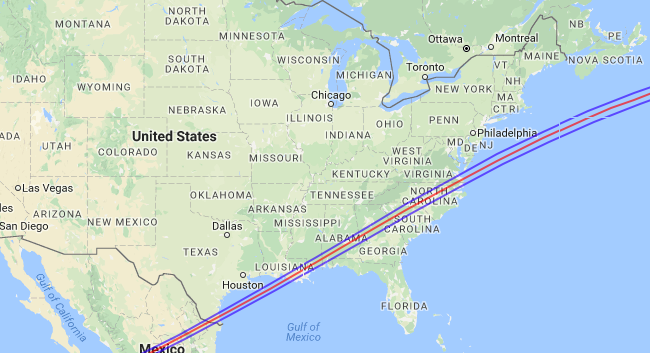 The path of the eclipse runs along the gulf coast of Texas. A few months later a major hurricane hits Galveston that is still considered the greatest natural disaster in US history. An influenza outbreak kills millions across the US and the world. The outbreak is believed to have started at Fort Riley Kansas, which lies just near the path of that summer's eclipse. Days after this eclipse the US successfully tests the first A-bomb. Less than a month later, two atomic bombs are dropped on Japan, the start of the US's rise as the leading superpower of the world. The path of this eclipse began in Idaho, moving upwards through Montana, eventually crossing deep into Soviet territory, linking the first use of atomic weapons with the initiation of the cold war and marking the US and Russia as the world's primary nuclear adversaries. JFK assassinated in November. 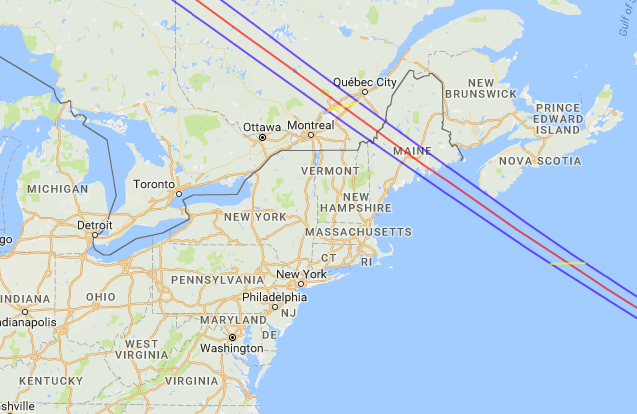 The path of this eclipse passed through Maine, just north of Massachusetts, JFK's home state and the state he served as senator. These events are tragic to be sure, but my intent is by no means to be a doomsayer. Aspects of the collective consciousness of the United States are up for healing and we can choose to be proactive in that healing process or choose to hide in fear. Which choice we make has much to do with our experience of the eclipse. The North and South Nodes of the Moon represent the points at which the Moon crosses the ecliptic (the apparent path of the Sun). This means that whenever we have a lunar or solar eclipse, both the Sun and Moon conjunct the North and/or South Nodes. 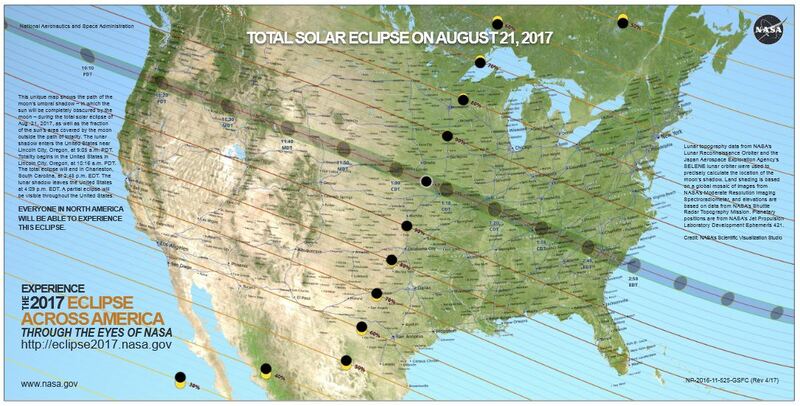 If you could see the Nodes as points in the sky, during a total solar eclipse you would see either the North or South Node right next to the solar corona. In astrology, the North Node represents the future while the South Node represents the past. The Moon, it can be said, represents the present moment tension between the two, the emotional conditioning that has got us to where we are now combined with the desire for a future that supports where we want to go. We cannot be free or truly secure if we cling to our past nor can we completely abandon it. We are locked in the middle, ever unfolding in the present moment. The Sun represents our force of will that drives us towards a better future by becoming aware of our emotional conditioning and adjusting appropriately to lead us to ever greater expressions of self realization. The Sun in correct operation with the Moon and its Nodes leads us to the joy of a fulfilled life. When the Moon blocks out the Sun during a total solar eclipse, it is as if our force of will is temporarily blinded by the dramatic drawing forward of our deeper emotional nature. Something that has conditioned us for years, perhaps eons, is being brought starkly to our attention before it is forcibly dissolved in the imminent revealing fire of solar will. When the eclipse is conjunct the North Node, what is being dissolved is in direct service to our future. You might say the future is reaching back to pluck from our life a block to its unfoldment. On August 21st we will experience a powerful solar eclipse at 28º Leo conjunct the North Node. In your own natal chart, the house that this degree falls within will indicate the area of your life where you will likely experience an end to something and the initiation of a new expression of that energy. If you happen to have a strong natal point between 26º-29º of Leo or Aquarius (Sun, Moon, Ascendant, Midheaven, etc) then this eclipse will be experienced quite strongly relative to the planet and house combination in question. Please note that the effects of eclipses are necessary, healthy and good. Eclipses operate like cosmic cleansers, purifying what can no longer be sustained, clearing the path for a better life. They are not always difficult, but even when they are, we can have faith that what lies beyond it is a future better suited to who we are becoming. Also, eclipses do not necessarily manifest immediately. The energy is released at the moment of eclipse and takes time to disperse. It can take up to a year before the effect is clearly seen. This eclipse is of particular importance to America. 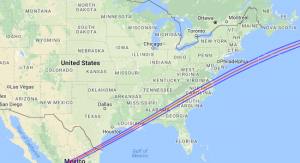 Its path cuts directly across the continental United States, while astrologically it opposes the United States Moon and hits a very sensitive point in the chart of Donald Trump. 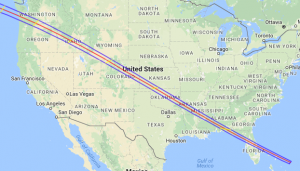 This has indeed been quite a significant year for the US and the eclipse suggests there's a potential for a major national event that would reflect a purging of unresolved collective emotional issues, brought about by an unprecedented power grab by either the President or some other executive force. The eclipse falls at conjunction to Donald Trump's Ascendant and Mars. He is feeling the strains and yearnings for greater power and still believes he can command more of it. Meanwhile, with Mars on the heels of the eclipse, there is a potential for some form of military involvement, and with Saturn precisely conjunct Trump's Moon, he is feeling acutely the pressures of his station, which could be driving his Leo need for ever greater self aggrandizement. He wants it his way, and his way only, and the only question is whether he will crash and burn or find the right sacrificial scapegoats to keep going (for now). I do not believe the Trump presidency is a tragic mishap. Trump is an archetype representing unresolved aspects of our national character, the stunted emotional development of our culture that needs to be heard and seen before it can be dealt with. A child does not grow when her emotional cries are put down. The best development occurs when her tantrum is allowed to express, to be witnessed and safely released. The inner child of the United States is holding on to a great deal of pain. We cannot heal it unless we see it, and only then can we respond to it. During this eclipse, spend some time quietly looking within and ask what must be released for your future to unfold. What is your best contribution to the collective healing process? Whatever life calls you to do, approach it with compassion, faith and fierce devotion to higher good. The best choices are not always clear, but if our intention to good is clear and we take the time to observe ourselves truthfully, we will make the necessary strides. Whatever this eclipse brings, we will weather it and rise wiser, stronger and healthier for it, as humankind has done countless times before. Glad you liked the article and the reading, Prashanti. It’s always an honor to be of service. Best wishes to you. Thanks for your comments John. I would like to think that such realizations are ultimately freeing to the heart and mind. Best wishes to you.